Bill Gross was just on stage to officially introduce UberMedia’s latest product, Chime.in. The app hit iTunes yesterday. It is an online mobile social network built around interests. We’ve been seeing a lot of companies trying to tackle the interest graph lately, and Chime.in is the latest. 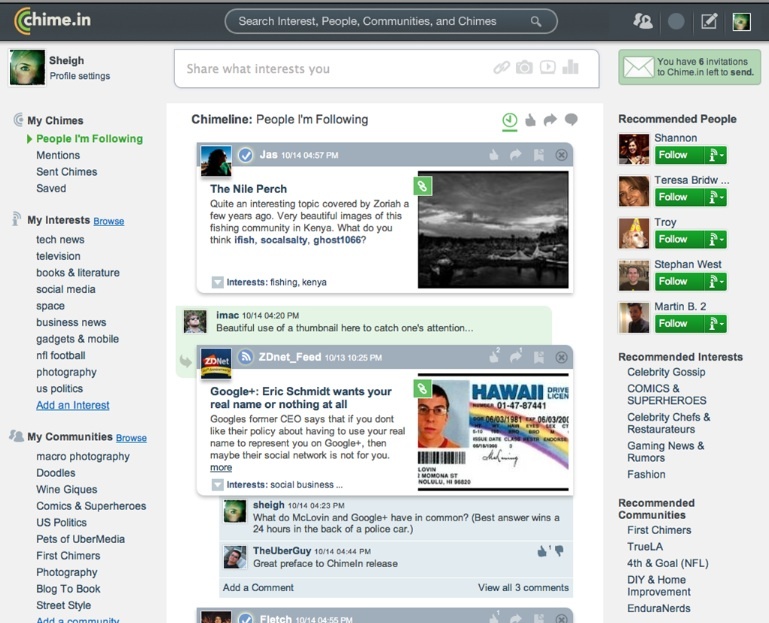 Chime.in does this by layering the interest graph on top of the social graph (the connections between people you know). One way it does this is by applying a more finely tuned “selective follow” model. “You can follow a part of person or a whole person,” explains Gross. So if you only care about what I say about technology and startups, but could care less about the photos I post, you can only follow my startup stream. In this way, Chime.in attempts to filter out a lot of the noise from your noisiest friends (hello, Scoble). Backstage, Gross also explained the difference to me between Chime.in and Google Circles (which lets you segment your friends and people you follow). “Google Circles is filtering on the outbound,” says Gross, “this is filtering on the inbound.” What he means by that is Chime/in doesn’t filter only by friends, but by the topics they post and share. Chime.in is designed so that people can share their thoughts, photos, videos, and links. It could also turn into a marketing channel for entertainment brands. Gross announced partnerships with E! Entertainment, Universal Pictures, Bravo TV and Disney from the start and an investment (in UberMedia) from Comcast. Here is where Chime’in’s revenue model comes into play. Brands get to run ads on their Chime.in page, as well as in the mobile app. These are like fan pages on Facebook, except that the brands themselves get to make money off the ads on that page. “we let any brand make any rich profile page, we give them the real estate adjacent to it. They want to be were the social activity is happening.” Instead of simply giving links back to their own websites, brands can monetize their social streams as well.